After an exciting day of fishing, you'll be greeted by our friendly staff and the warm, relaxing atmosphere of our Moose Point Lodge. Enjoy delicious home-cooked meals complete with prime steaks, homemade bread, turkey with all the fixings, hearty breakfasts — some say they come just for the food! We also offer a guide service that will professionally prepare your shore lunch. There are five refreshingly modern and well-kept lakefront guest cabins on a beautiful sand beach next to the lodge. It's a great swimming beach, and many guests also enjoy our wood-fired sauna. 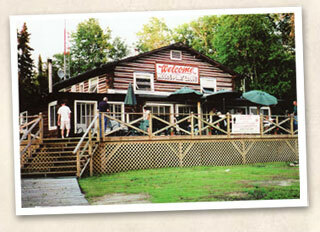 Come experience genuine hospitality and the ultimate in Northwood's comfort at Moose Point Lodge. © Copyright 2008. Moose Point Lodge. ALL RIGHTS RESERVED.